I am jumping the gun a little bit! 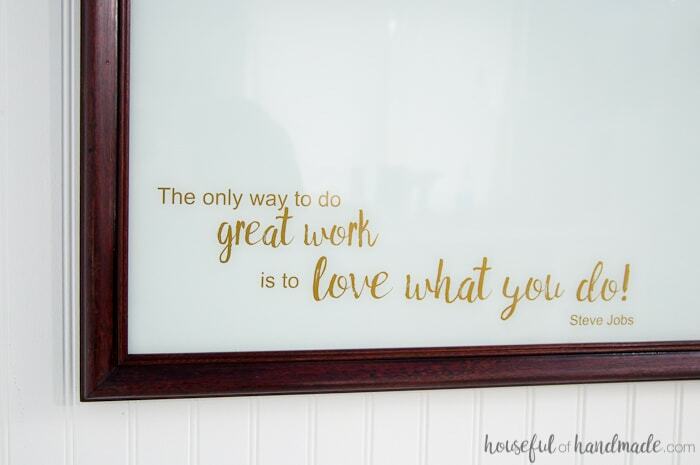 Hopefully no one gets too mad, but when I realized how many projects I wanted to get in my new office & craft room for the $100 room challenge that starts in March, I realized there were not enough days to share all the DIYs I have planned. So I am sharing my new DIY idea board a few days early. 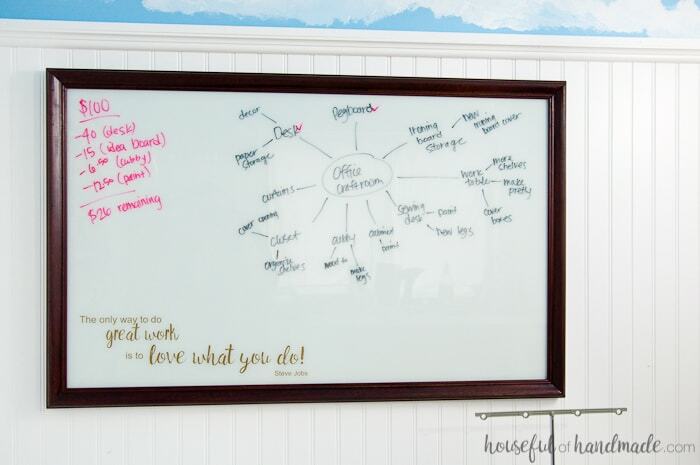 This idea board is more about helping me stay organized in my new office than it is to make it pretty. I know, a room challenge is suppose to be pretty, but it also has to be functional right? So I took an old thrift store picture frame and made it pretty. Now it is the perfect balance of pretty and useful for my upcoming room redo. And more importantly, I can use it to keep track of everything that I need to accomplish to make my room AMAZING! What exactly is an idea board you ask? Well it’s really just a large whiteboard that I can use to jot down all my thoughts and ideas. Right now, it’s a jumble of everything that I want to accomplish in my office for the $100 room challenge. 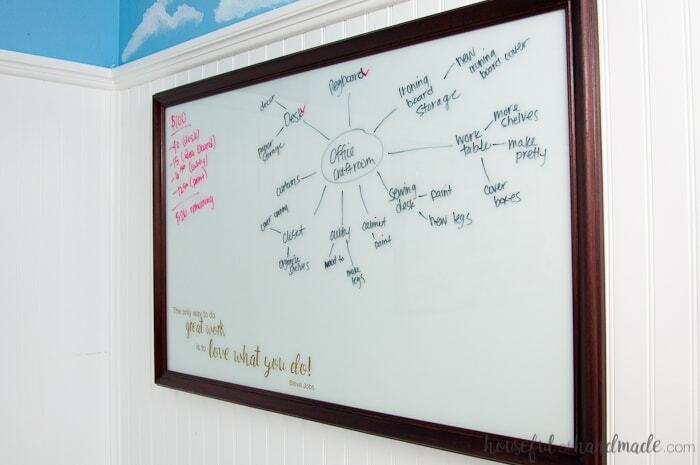 I like the white board element for my idea board so I can quickly sketch out ideas as well as write them out. Some people like using sticky notes on their idea boards. Either way, I needed a place to just let the creativity flow. Redoing an entire room for $100 is a new challenge for me, so naturally I went thrifting to see if I could make my money stretch. 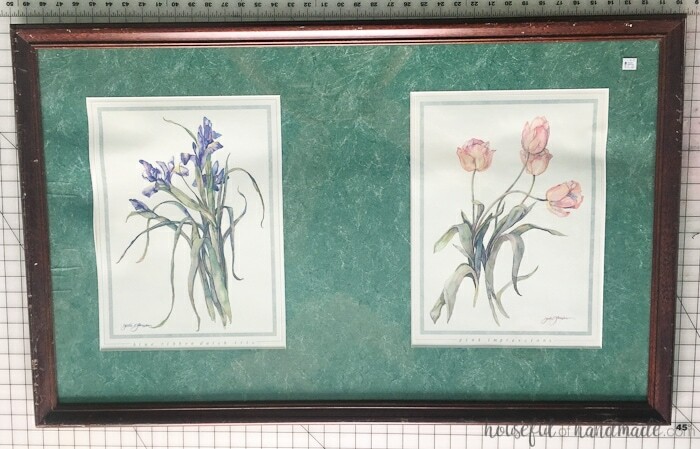 I found this picture that had some water damage to the art, but the frame was in good condition. More importantly, the size was large enough for lots of ideas and notes. However, it was still $15! Normally I wouldn’t think twice about spending $15 on a very large and nice picture frame because we all know how expensive picture frames can be. But that was 15% of my total budget. That made me stop to pause. I knew I could get creative by reusing other supplies I already had, however, I did not have a large picture frame that I didn’t need anymore. So with my soon to be DIY idea board in hand, it was time to work my magic and make this big purchase (compared to my total budget) really worth it. I kept reminding myself that this purchase was for more than a pretty room, it was to make me more productive in my new office. And really, that is definitely worth $15. 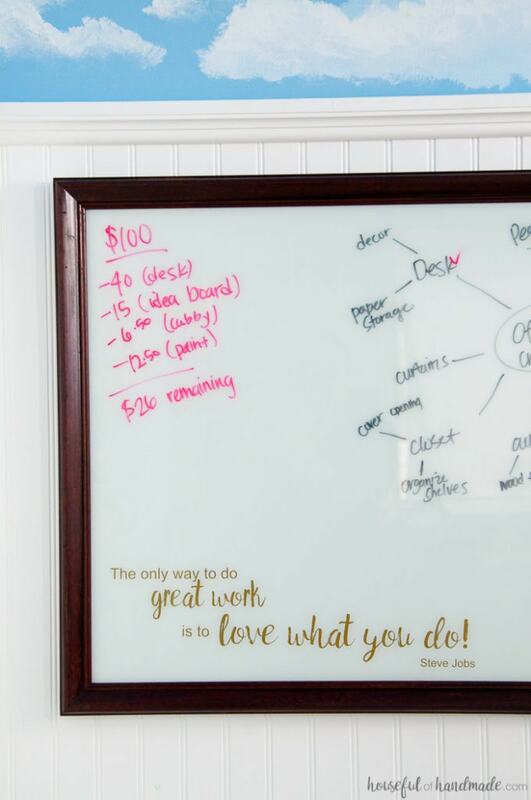 But I was determined not to spend a penny more to create my whiteboard, and I almost managed to do it. 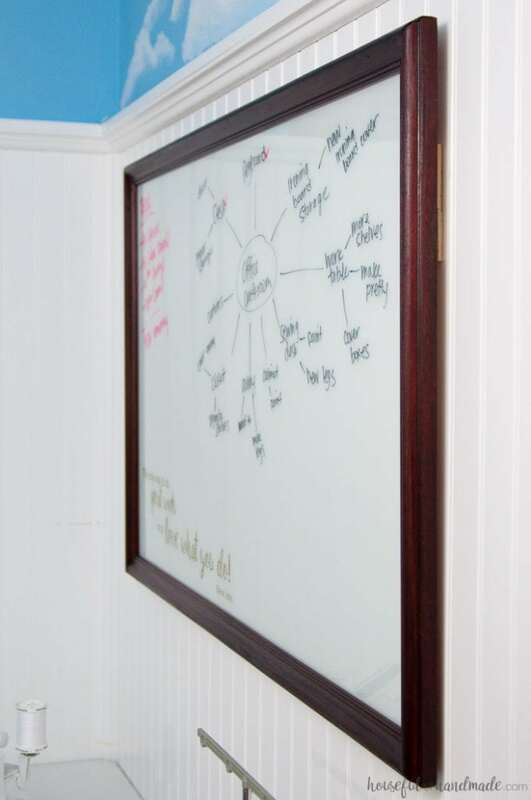 I am sharing how I turned the glass from my picture frame into a customized whiteboard over at Silhouette School Blog today. Get the tutorial here. I was able to use up a piece of vinyl that I already had in stock (and luckily matched the room). 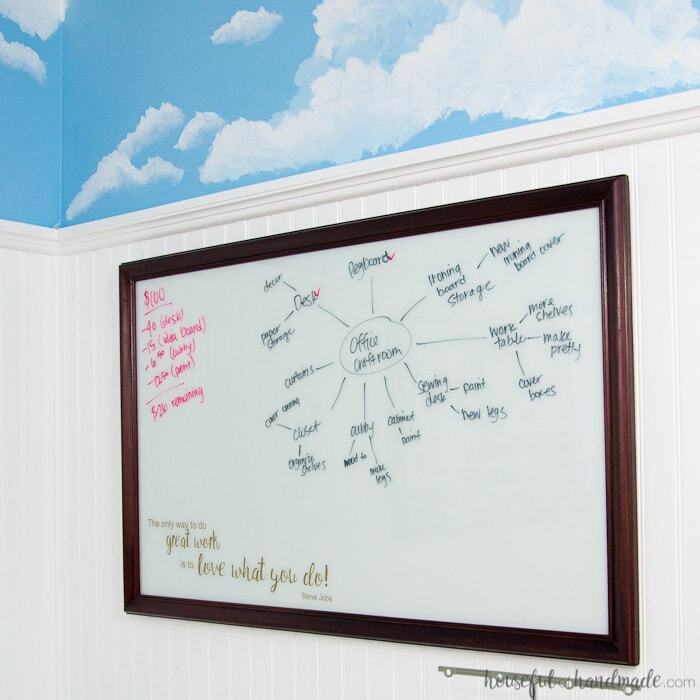 And by some miracle, had enough paint in 2 almost empty cans to make the whiteboard with no additional cost. Then it was time to figure out how to pretty up the frame. The frame was pretty beat up, I considered spray painting it, but didn’t have a color I wanted to use on hand. Since I was determined not to spend a penny more than the $15 the frame cost, I decided to try to just freshen up the frame instead of painting it. I used a piece of medium grit sandpaper to roughen up the frame. I didn’t want to completely remove the original finish, but just to evenly sand down the finish over the entire frame. Then I wiped off the sand dust with a damp paper towel. 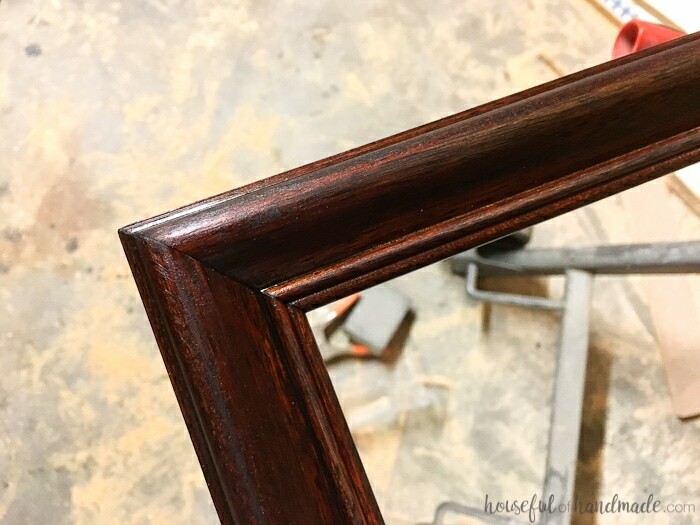 Next I grabbed a can of dark walnut stain that was almost gone and put a generous coat over the entire frame, making sure to get into all the crevices. After a couple minutes, I wiped off the excess stain, but was careful to not get all the stain out of the crevices so they would stay a little darker. Then I just had to let it dry. That was seriously all I had to do to take the beat up frame from looking like it had seen better days, to looking brand new. The whole frame is a bit darker because I used the dark walnut stain, but still has a red tinge to it. It looks expensive and brand new. You cannot see any of the nicks and dings that were there before. Now I just had to decide how to hang my new DIY idea board. After putting the glass back inside the frame, I ended up having to buy 2 pieces of foam board from the dollar store since the backing from the original picture was completely damaged (I thought I had some in my stash, but no luck, I was completely out of cardboard too). I thought about using the eye hooks and picture wire from the original frame (you better believe I kept it), but I knew that would be very wobbly on the wall when I was writing on it a lot and then cleaning the board off. Instead, I decided to use a french cleat. Anyone that has done woodworking may have heard of a french cleat. It is the best way to hang heavy stuff . It’s super sturdy and makes hanging things so easy. I have actually used french cleats on 3 projects in the past month (none of which have made it to the blog yet, sorry there is a lot going on right now). One might say I am a bit obsessed with them, but it’s for good reason. You can buy a metal french cleat from the home improvement store, but that would be a huge hit to my budget. And as long as you have a saw that can rip a board at a 45 degree angle, you can make one from scrap wood! So I pulled out my table saw and set to work. I used a scrap of 1/2 plywood (and that scrap actually came from the desk I am building for my new office so technically I bought it for the challenge). But you don’t need a large piece. My piece was 2″ smaller than the width of my frame x 4″. 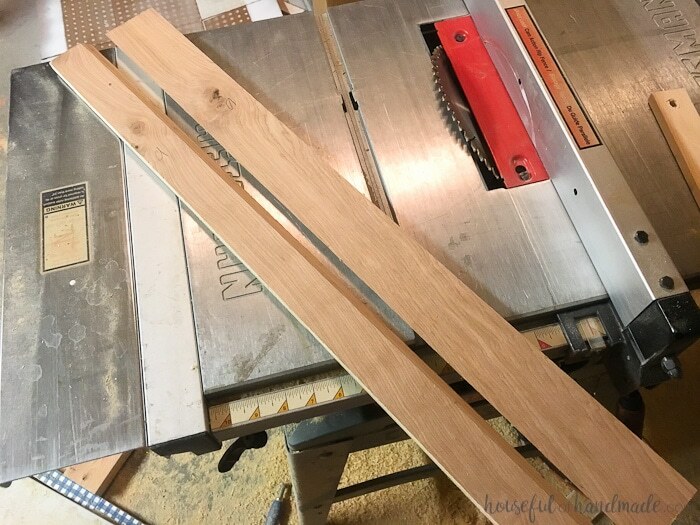 Cut the board down the middle (no need to be too precise, I just eyeball the center of the board) with your saw blade on a 45 degree angle. Now you have two boards that fit together like a puzzle along the length of the board. 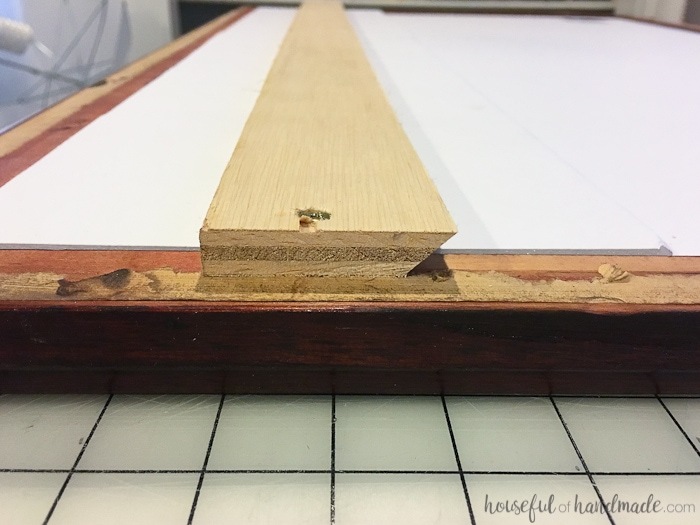 Attach one of the pieces so the top, non-angled side of the board is level toward the top of your picture frame. I measured 3″ down from the top of the frame on either side and then secured it to the frame with a 1 1/4″ screw on each end into the frame. The important part is to make sure the angled part of the board is attached so that it creates a notch for the other board to slide into (this is kind of confusing but check out the picture below). Then you attach the other board to the wall, making sure the angle is at the top of the board and away from the wall in a way to create a notch as well. 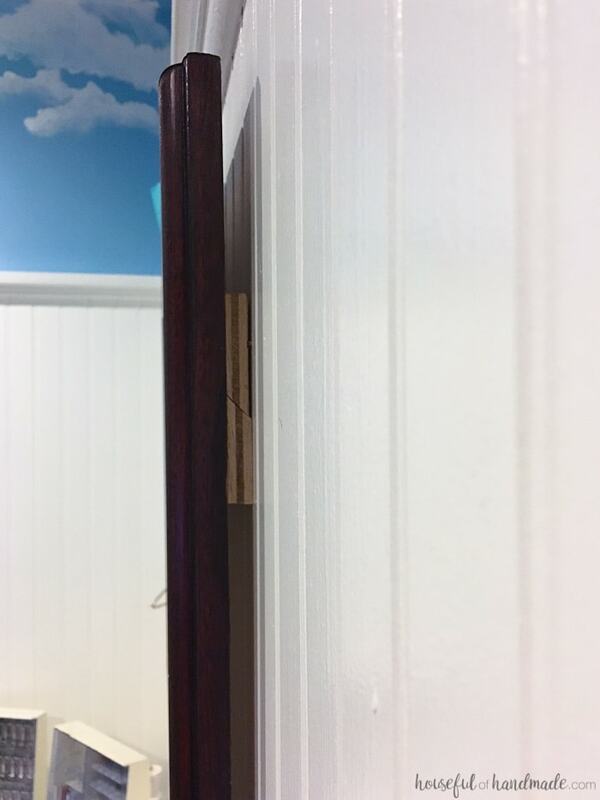 Use a level to make sure it is level and secure it with a few wood screws into the walls studs. Getting into the studs is super important for heavy items. 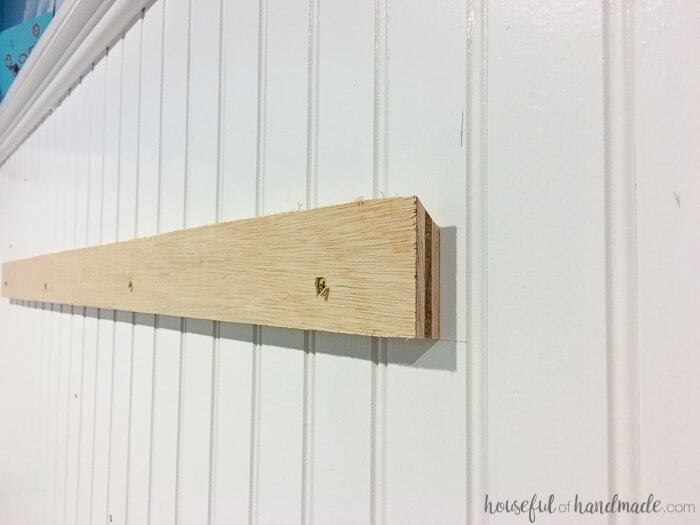 To hang your frame, all you need to do is position it flat against the wall above the board. Then slide it down so the two angled pieces slide together. And because both boards were leveled when they were attached, the new DIY idea boards should be perfectly level and super sturdy. Now I have the perfect place to keep all my thoughts together. And as you can see, help me to figure out where to spend the rest of my budget for this room challenge. 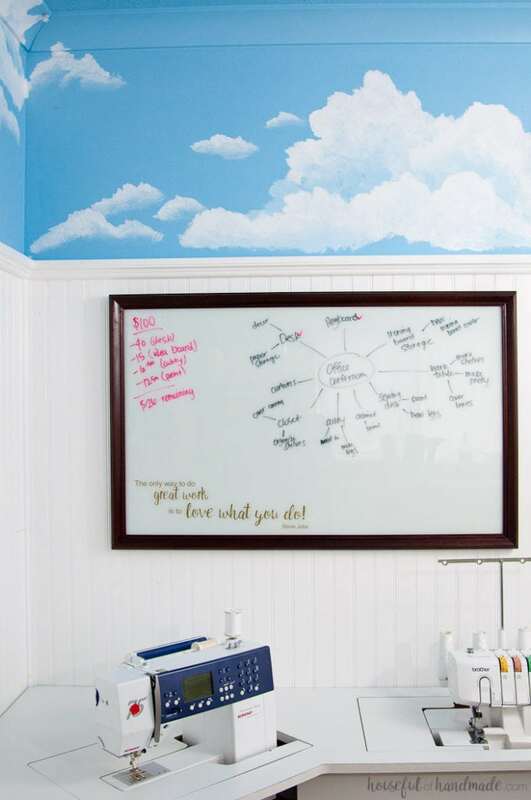 But even after I make over my office and craft room, this will be a great way to keep my creativity focused. I am sure going to love having an idea board. And make sure to follow along so you can see how I transform this room for just $100. You can see that I have lots of ideas, I just hope I manage to get everything done! 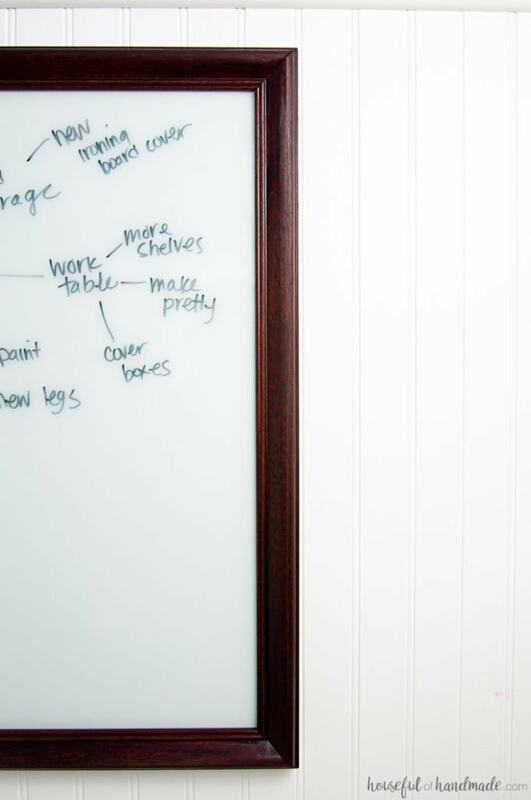 So useful and a great upcycle! I need one of these to keep me on track! A homemade french cleat! I would have never thought of that! I wonder if our saw can do that? fun idea! Also, can we talk about that table with the two sewing machines!? Wicked! This is very smart idea! I think its the next best thing to designer blueprints! Thank you Maria! I am really hoping it keeps me on top of things. Thank you! I’m loving it.